The feelings of guilt and uncertainty that dominate this stand-alone addendum to Alberto Ruy-Sanchez’s 1987 novel, Los demonios de la lengua, wrestle with the tension between religion and eroticism that was central to the author’s Jesuit upbringing. The story’s prose-poetry style prioritises diction and imagery over narrative, making for a complex and rewarding read. Not words but serpents emerged from his mouth. And some of these vipers had the heads of goats, of iguanas, salamanders, toads; they were eagles without wings, fish without rivers, tongues without saliva. One tongue divided in two, in three, in ten, in six times one hundred and eleven nightmares. And the odor that emanated from these tongues, reminiscent of the rotten fish that serve as a delicacy in Sweden and an omen of tragedy in Denmark, was so dense as to be visible—and it looked back at us. It was a cloud with eyes, horns, jaws, a bristly beard and pointed ears. It looked like Satan on the verge of unleashing his fury, but it was only the scent of Don Marcelino’s breath as he dozed at midday. He had fallen asleep over his papers, mouth wide open, in the midst of writing against his countrymen who had neglected the elemental rules of faith, law and orthodoxy. And he woke with the taste of long-fermented apples in his mouth. We can almost imagine Don Marcelino completing this sentence and feeling the enormous relief of having written it. He’s very satisfied with himself. We can almost see him smiling. Of course he smiles very seldom, if at all. Suddenly, he knows what the title of his masterwork will be: A History of the Spanish Heterodox, by Don Marcelino Menéndez y Pelayo, director of the National Library. We can almost see him dozing off contentedly over his manuscript, savoring the tremendous glory the many volumes of his book will bring him. The reputation he has cultivated in Madrid’s most virtuous circles—of being a wise man, but hard, too—will spread like wildfire. His head tilts forward gradually to rest on the words he has just written. And before the ink can dry, his most persistent nightmare begins again. Nothing can stop it. Not even he, still half-awake, dares to resist the arrival of sleep, because he feels in the depths of his being that the portion of pleasure with which his dreams begin is worth experiencing; or rather, dreaming. Although the pleasure inevitably devolves into torment, he still craves it, that small indulgence he would never allow himself while awake. And that necessity smoldered secretly within Don Marcelino, and many others besides, making his mouth water when he heard, saw or thought about her. And of course when he dreamed about her. He sees himself extending a hand towards Juana. Or rather, towards two apples. Two promises. And he bites them. He feels the skin of the fruit on his tongue and then the flesh, which is more porous and yields more easily to his teeth. His mouth fills with the liquid that bursts from the apple and it is not, he thinks, like a juice but rather like fresh milk foaming around the edges. Marcelino (without the “Don” now) is intoxicated by Juana’s apples. And he dreams that she breathes. And with the light rise and fall of her chest towards him and towards herself, his face is bathed in an apple-scent that makes him lose his senses. He can hardly see, he can hardly hear, he hardly knows what he’s seeing and hearing. Beneath a Mohammedan moon like an apple bitten by the greedy shadow of night, stretched out in the grass, Marcelino sinks his teeth into her apples. Like the flesh of two moons in the swaying shadow of Juana la andaluza. Suddenly he is startled by a torch flaring up between his legs. He wants to ask for help but no sound escapes his lips. The bits of apple in his mouth are a thousand small fish that bite and blister his tongue, devouring it as it swells. But as they consume it, as they fill themselves with his tongue, as they possess it completely, they become a tongue with a thousand tails. Marcelino feels Eternal Good battle Eternal Evil in his mouth for the possession of his tongue. He wants to swear at Evil so that Good will triumph, but the insult will only strengthen the enemy. It occurs to him then to pray, but the selfishness of the prayer invalidates it. And what emerged from his mouth were no longer words but serpents. Some of these vipers had the heads of goats, of iguanas, salamanders, toads; they were eagles without wings, fish without rivers, tongues without saliva. One tongue divided in two, in three, in ten, in six times one hundred and eleven nightmares. And the harsh odor that emanated from these tongues was reminiscent of the rotten fish that serve as a delicacy in Sweden and an omen of tragedy in Denmark. An odor so dense as to be visible—and what’s more, it looked back at us. It was a dense cloud with eyes, horns, jaws, a bristly beard and pointed ears. It looked like Satan on the verge of unleashing his fury, but it was only the scent of Don Marcelino’s breath as he dozed at midday. Marcelino never learned the name of the thing that so tormented him during his siestas. Maybe he never wanted to know. His rigid morals and the certainty that can be found in all of his work derived in large part from his ability to turn his back on dreams. Oddly enough, the one man who did know what tormented him was the Dominican priest he most hated and insulted in his books: Juan Antonio Llorente, Holy Office commissioner and author of a number of books, among them A Critical History of the Inquisition of Spain and, above all, a book that he did not manage to publish during his lifetime: A Treatise on the Demons of the Tongue. Don Marcelino’s dreams deserve to live on within its pages rather than, as they do now, in the rumors that Juana la andaluza told to her granddaughter, who in turn told them to her daughter, who told them to me one night in Seville, when I kissed her and told her, I don’t quite know why, that she smelled like apples. 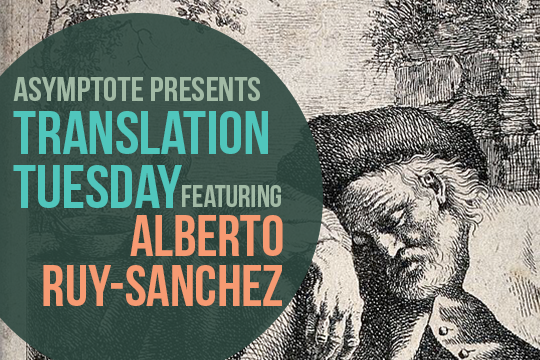 Alberto Ruy-Sánchez, born in 1951 in Mexico City, is one of Mexico’s most prominent writers. Although he is best known for his “Mogador Cycle,” a quintet of sensual novels set in the Moroccan city of Mogador, he has also published books of poetry, essays and literary criticism. Since 1988, Ruy-Sánchez has served as editor-in-chief of Artes de México, an art magazine that has received more than 150 international awards. He was declared Officier de l’Ordre des Arts et des Lettres by the French government in 2000 and received the Gran Orden de Honor Nacional al Mérito Autoral in Mexico in 2005. Nina Perrotta graduated from Brown University with a degree in literary translation. She is currently living in Pontevedra, Spain, where she is working as an English teacher and continuing to translate.